Merry Christmas from the Glenn Beck compound. 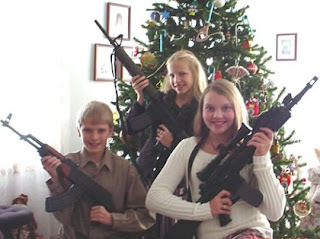 Christmas is all about family, togetherness and automatic weapons. The Johnson kids know one thing, if Santa thinks he can come into their house and get all kissy-kissy under the mistletoe without bringing them a Bakugan Battle Arena, then this Christmas will be his last. Charlton Heston's grandkids have a very Merry Christmas. And so, Moooooog, at this wonderful Christmas time, you be hangin' with Dufus. Congratulations!!! Thanks for playing everyone and for enjoying the pics this year. Here's to a happy New Year. What a surprise...moooooog! 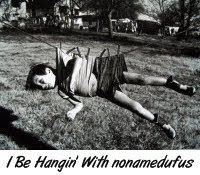 Your official name for your caption contest picture should be the "Moooooog35 Not-So Memorial 1st Place Banner". Does Moooooog do anything beside sit around making up captions and vlogs these days? How does he do it? Quirks: He indeed got 'er done. The most winningest captioner of dufus pics all year. Don: Ha, ha, yeah, maybe I should permanently re-name this thing. CatLady: I dunno. Let's ask him. And I could not think of anything except.."Thank you Grandma - again"
Phillipia: The family that "sprays" together stays together!